Colligan highlighted and stressed a few points about the new platform. He continually stressed the importance of the user experience citing the ability to have an instant on, highly portable device with great battery life. Other highlights included greater hardware flexibility and the ability to handle simultaneous voice and data, two key ares which have hampered the traditional Palm OS in recent years. Another key aspect would be the device's web browsing experience. Colligan said Palm is focusing highly on connected web applications and web services built around mobile devices. He cited the ability to easily backup and restore over the web, delivering software and device updates over the internet and wireless software distribution. The recent Opera brower licensing agreement is likely tied to this new platform. 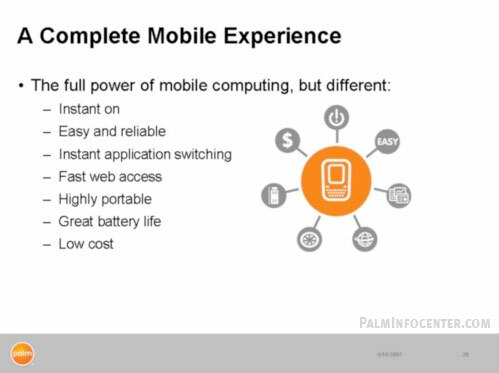 Colligan also revealed that this was a new platform that Palm has been working on, in house for a number of years. He stated that Palm would not license this new OS to outside hardware companies, meaning this will be a Palm exclusive platform. This is a separate project from Palm Inc and is not related to the ACCESS Linux Platform, which is being developed by ACCESS, formerly PalmSource. Many of the technical software and hardware details have yet to be announced. Some further hints and details about the new device were alluded to in the question and answer session that followed. Ed Colligan remarked that we could expect to see new products "very soon" this year on both existing and the new linux based platform. During the last quarterly conference call, Colligan said that "clearly we [Palm] have been working on a major new area that has been speculated about in the press and talked about by Jeff Hawkins. Hawkins previously dropped major hints that he would reveal more details for Palm fans at an upcoming conference in May. At various points Palm executives talked up the attractiveness of free wireless data access and stated that Palm has developed a unique implementation of WiFi in order to maximize the battery life in regards to future products. Colligan also mentioned that it will not be critical to offer this new platform/device initially through carriers. He indicated that Palm is going to offer this product direct to customers, but then said they could eventually be offered via carriers. This could indicate either that the first generation may not have or require telephony functionality, and might be positioned as a wireless Internet device. On the other hand, it may be user upgradable to wireless data service or offered in multiple versions with and without phone service. The most likely scenario is that this new OS will power a wide range of devices from Palm in the future and the first version may debut on a PDA like tablet device, with smartphones to follow down the line. The Analyst presentation concluded without any technical or developer details revealed about the new Linux based platform. Many questions remain to be answered as to what the official name will be, what Linux technologies are included, how Palm OS Garnet compatibility will be handled and what the development environment will be composed of. Colligan ended the Q&A session stating that the Linux based platform will be a integral "core technology" for Palm for the foreseeable future.